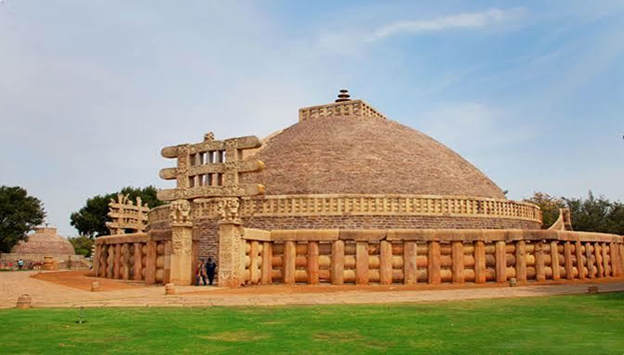 This is the Great Stupa at Sanchi, Sanchi is a small village, 46 kilometre far from Bhopal, which is also one of the important Buddhist monuments significant the eminence of Buddhist art and architecture. Placed at Sanchi Town, in the state of Madhya Pradesh, India, this Stupa is the earliest stone structure in India that was built by the emperor Ashoka during the Mauryan period. The height of its huge hemispherical dome is nearly 54.0 ft, which consists a chamber at the centre, where we see the relics of Lord Buddha. Four gateways with a good art generally named as toranas are facing the four directions, a balustrade enclosing the whole structure was added. In the year of 1818 British General Henry Taylor discovered this site and the work of Restoration on it started in 1881 and had finished in 1919 under the observation of Sir John Hubert Marshall, who was the director general of the Indian Archaeological Survey. The splendid Sanchi Stupa has considered to be one of the oldest stone structures in the world and it is one of the UNESCO recognized World Heritage Site in India. It is one of the oldest Buddhist pilgrimage point in India.